A play based on the 1913 copper strike by playwright and drama professor Steve Feffer will have its first reading at the Calumet Theatre this weekend. The premier of the play will also coincide with Christmas in Calumet festivities taking place throughout the month. The play will debut at 1:00 pm on Saturday December 14. Admission to the event is free and open to the public. The Calumet Theatre website is currently undergoing an update so there was limited information about the scope of the play online. For more information please contact the Calumet Theatre box office at (906) 337-2610. For more information about Christmas in Calumet, please visit the Main Street Calumet website. 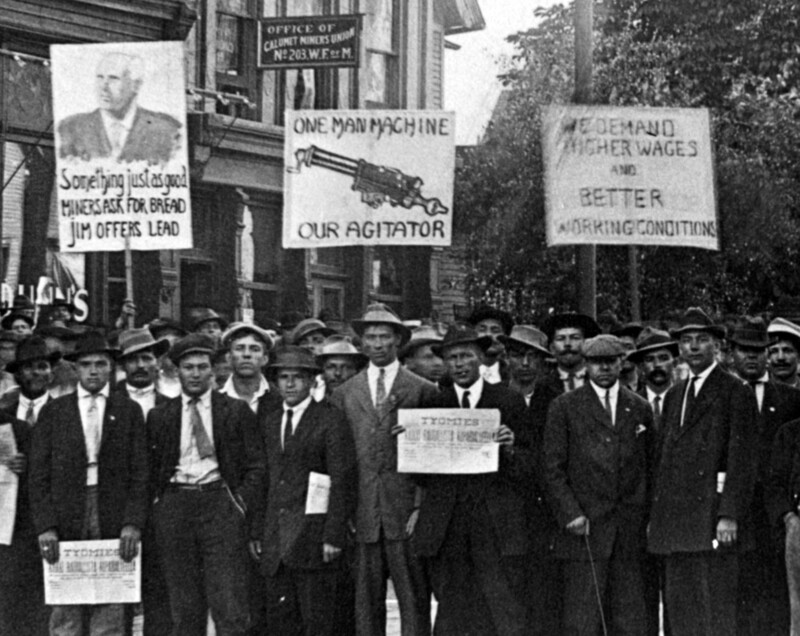 Retrospection & Respect, the academic symposium that will take place at the historical conclusion of the 1913-1914 Michigan copper miners’ strike, now has an active website through Michigan Tech’s Digital Commons. The website is an updated planning hub that will let all interested stakeholders stay informed about symposium updates, news, schedules, etc. The Call for Papers for the symposium is still active, so if you are interested in speaking at the symposium please submit an abstract by December 16th. Thomas LaVoy, born in 1990 in Marquette, Michigan, is a talented pianist and composer who has been crafting a symphony based on the 1913 Italian Hall disaster that took place in Calumet. The composition, “A Child’s Requiem,” was commissioned by the Marquette Symphony Orchestra and it will have its world premier at 7:30 pm on December 14, 2013 at the Louis G. Kaufman Auditorium in Marquette. 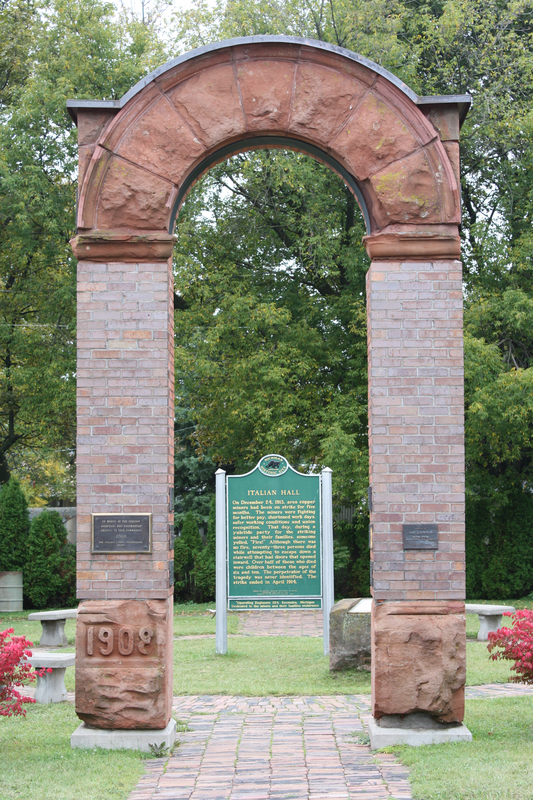 The debut of “A Child’s Requiem” was timed to come out just before the centennial anniversary of the Italian Hall tragedy, which took place on Christmas Eve 1913. Tickets available at the NMU EZ-Ticket outlets located in the Superior Dome or Forest Roberts Theatre box office. Phone Orders can be directed to 906-227-1032 and online orders are possible through http://www.nmu.edu/tickets. Tickets may also be available at the door prior to the show if seating is still available. A sample of music from the composition can be heard below. A new documentary, Red Metal: The Copper Country Strike of 1913, is coming to the Calumet Theatre on December 6. The film is also being aired on local PBS networks around the country. Ticket and time information for the Calumet Theatre screening will be released soon and I will post it on the calendar of events. The following synopsis of the film was taken from the Calumet Theatre website. Tonight in the Commons Room at the Calumet High School Dr. Timothy Scarlett, director of Michigan Technological University’s Industrial Heritage and Archaeology Program, will discuss the archaeology survey his Industrial Archaeology students conducted at the Italian Hall Memorial Site for the National Park Service in the fall of 2012. According to the Keweenaw National Historical Park the survey included “extensive background research on the three city lots of the memorial site, along with remote sensing survey and a bit of excavation to assess the integrity of archaeological deposits.” While there were no significant deposits revealed on the lot of the memorial site itself, there were archaeological features uncovered on the lots to the north and south. Scarlett, will explore their findings, how the information can be used, and also how his students helped the NPS staff to prepare for the centennial of the Italian Hall disaster. The presentation, part of the KNHP Fourth Thursday in History Series, will take place at 7:00 pm tonight in the Commons Room at the Calumet High School, located at 57070 Mine Street, Calumet, Michigan. This event is free and open to the public. 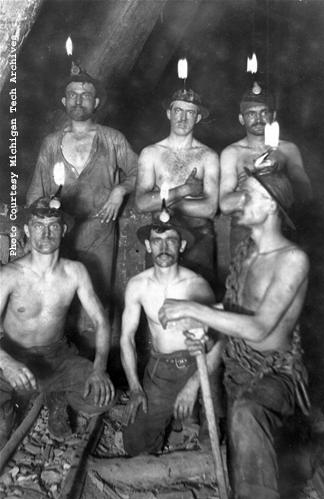 “People, Place and Time: Michigan’s Copper Country Through the Lens of J.W. Nara,” a traveling exhibit created by the Michigan Tech Archives, has moved to the Portage Lake District Library in Houghton, Michigan. The exhibit explores the life and times of Calumet photographer J.W. Nara and is open to the public through Dec. 16 during the library’s normal hours. The library is located on the Houghton waterfront, at 58 Huron Street, Houghton, MI 49931-2194. John William Nara was born in Finland in 1874. He later immigrated to the United States and established a photographic studio in Calumet, Michigan, in the heart of America’s most productive copper mining region. In addition to posed studio portraits, J. W. Nara’s lens also captured the people, place, and time he experienced in Michigan’s Keweenaw Peninsula. Copper mining and industry are an important part of the story, but Nara also captured the Keweenaw’s rural landscape, including local farms, shorelines, lighthouses, and pastoral back roads. The traveling exhibit, funded in part by descendants Robert and Ruth Nara of Bootjack Michigan, works from historical photographs held at the Michigan Tech Archives. Interpretive panels highlight the people, places, and times that J.W. 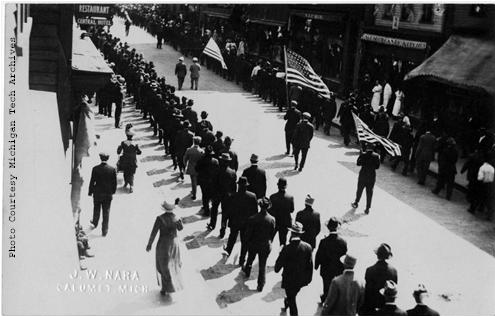 Nara experienced during his lifetime and include material on urban life, farming, and the 1913 Michigan copper miners’ strike. A small exhibit catalog is available at no charge and includes three Nara photograph postcards from the collection. For more information on the installation, contact the library at 906-482-4570 or via e-mail at info@pldl.org. Additional information about the exhibit is available from the Michigan Tech Archives at 906-487-2505 or via e-mail at copper@mtu.edu. This is just a friendly reminder that the 1913 Strike Singers will be performing tonight at the Calumet Public School Library. The concert will begin at 6:30 pm. Song and attire will take you back in time to 1913 on this lovely fall day! This event is free and all are welcome to attend.